When Yousef first conceived the idea of Circus over a decade ago, he wanted to promote a party in his then hometown of Liverpool for somewhere he could play quality electronic music and have fun. And from its first bass-reverberating session, Circus has evolved into one of the best house and techno parties on the planet. Circus has come a long way. What started off as a simple ‘house party’ in one small room has become a globally recognised club night of immense stature, reaching a decade of brilliant parties which inspire its audience and DJs alike. 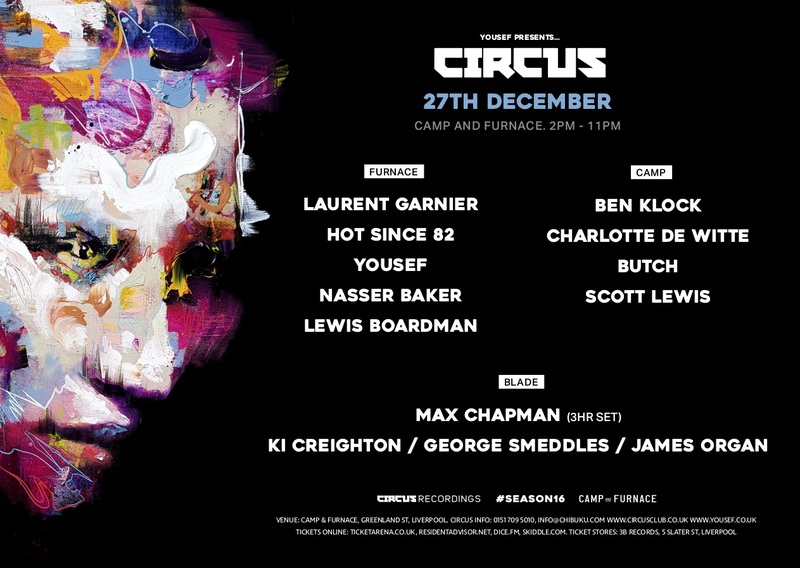 Circus has hosted pretty much every iconic figure of dance music; Sven Vath, Carl Cox, Loco Dice, Luciano, Ricardo Villalobos, Carl Craig, Laurent Garnier (DJ sets & live), Marco Carola, Jamie Jones, Adam Beyer, Derrick Carter, DJ Sneak, Butch, Sasha, Seth Troxler, John Digweed, Aeroplane, Heidi, Dennis Ferrer, Magda, Heidi, Maya Jane Coles, Nick Curly, Tim Green, Raresh, Guy Gerber and many, many more have all contributed to the club’s illustrious history, whilst helping to set its future course. Circus has enhanced Liverpool’s reputation as an epicentre for electronic music culture. Its revered status is augmented by the quality of its bookings and the loyalty of its crowd, crowned by the 10th anniversary celebrations in September 2012, and the series of X parties through the rest of the year. It’s a club whose founding ethos remains the same to this day: ‘serious music and fun times’. It’s also a club whom for each show gives a debut, introducing new talent to the city; Circus was the first to bring the likes of Loco Dice and Davide Squillace to the UK and among the first to champion now global stars like Seth Troxler and Jamie Jones, when they were unknown years ago. The recognition has come quick and fast, winning UK Club Of The Year from the BBC and recently praised as Mixmag’s ‘number one’ night. The dance music press continues to universally respect and admire the club’s achievements, praising each new chapter. When BBC Radio 1 wanted to celebrate their epochal 500th Essential Mix DJ, Circus was their obvious choice to host the historical occasion. The event saw Ritchie Hawtin pitted side by side with Sasha, with Pete Tong holding court as Aeroplane made history, with Yousef of course taking centre stage. Whilst its home is resolutely Liverpool, the club continues to garner international coverage, becoming one of the leaders in electronic music, building residencies in London and New York. At the centre of it all has been Yousef. Just as his club night has matured and developed, so has he. His sound continues to morph constantly, moving towards a full and complete spectrum of quality house and techno, with dance floor driven electronica, as well as delivering his 2nd artist album, A Product Of Your Environment, to critical acclaim. Yousef is the creative force who drives Circus forward, booking the line ups personally, working with Chibuku-Shake-Shake and Warehouse Project promoter Rich McGinnis, to make the event into much more than just a collection of DJs; Circus has real heart and emotion, captured in a few sublime hours each month. Whilst it’s rare for a DJ to promote his own night, it’s even rarer to find such a successful one, which is testament to years of hard work and dedication from Yousef and the team behind Circus. Touring the world many times over, playing in some of the most famed venues out there, has helped distilled Yousef’s vision for Circus into what it is today. It can count on a resident roster which includes NRK, Rekids and Souvenir producer Lewis Boardman, Cafe Mambo legend and Acid Monday Alex Wolfenden and the rapidly rising Scott Lewis alongside the irrepressible Yousef. But above all, it combines the indomitable spirit which was there from the start, with just 400 patrons at the birth of something truly special. It’s this family which sees Circus enter 2013 as one of the world’s leading house and techno parties, its future very bright indeed.